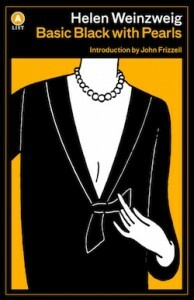 Basic Black with Pearls by Helen Weinzweig is having a second life as a 35th anniversary reissue. The novel won the 1981 Toronto Book Award and gained critical acclaim when it was first issued. Yet, it had been largely forgotten by most Canadians until recently, its revival heralded by reviewers in Canada. The Polish-born Weinzweig began writing comparatively late in life and certainly never became a household name like some of her contemporary Canadian writers. However, she cut ground with experimental writing that, in this novel, employs dreamlike progression as her character assimilates the dramatic stories of ordinary people she encounters as she moves from place to place and mood to mood. The narrator, Shirley Kaszenbowski, travels the world under the alias Lola Montez. If the reader is not quite sure who Shirley/Lola really is at the start of the book, it is amply clear by the end that she doesn’t know precisely either. Her dull, although far from normal, home life is bearable thanks to a secret world she inhabits, in which she travels the world meeting her lover, Coenraad. Because of Coenraad’s top-secret role in a spooky intelligence service, rendezvous locations are secretly conveyed through numerical codes hidden in the latest issue of National Geographic, leading her to dramatic forays into remote parts of the world. The theatrical, noir-ish story (the title marquees basic black, after all) unfolds through furtive, whispered conversations, overheard snippets, recollected traumas and sexual fantasies … or are they real encounters? It is often dark, sometimes dismal and lonely, yet the writing is brisk. Emotions and events transpire and are left behind in quick succession as the story – and Lola’s adventures – speed along. Much is packed into the novel of little more than 100 pages. And while the book is fiction, it captures a real sense of a Toronto gone by: the original Shopsy’s backing onto the Yiddish theatre, and passing mentions of landmarks, familiar and less familiar, as she trudges the city’s streets like a lost soul. Some reviewers have viewed this novel as a feminist tome. If so, it is in the sense of illustrating how some women’s lives are dictated and proscribed by the men in their lives. Or, figuratively or literally, not in their lives. Despite critical acclaim, Weinzweig never joined the famous names of Canadian literature, or even the smaller shelf that is Jewish Canadian literature, and she was well aware of this before she died in 2010. The iconic Canadian literary publisher House of Anansi recognized something in this work that deserved to be shared with another generation. Weinzweig would be pleased. If only bookstores were still a thing. Basic Black with Pearls is also available as a digital book.